Alexandra Fletcher discusses some of the ethical and practical issues associated with caring for and displaying human remains in the British Museum collection. Understandably the collections of mummified human remains are a great source of fascination for visitors and the Egyptian galleries are always busy. The current exhibition Ancient lives, new discoveries uses the latest CT-scanning technology to see within the mummy wrappings of eight individuals, providing incredibly detailed images of conditions that affected their lives and their treatment after death. It will surely be popular with visitors but these same visitors may not realise that the Museum cares for more than 6,000 human remains, which cover a much broader range of time periods and places than just ancient Egypt. Some individuals are well known, such as Lindow man, the Iron Age bog-body found in Cheshire in north-west England. Others lie in storage facilities both on and off the main Bloomsbury site. 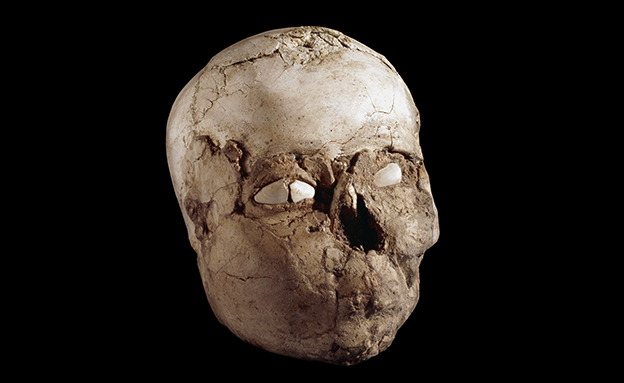 They range in date from the truly ancient Jericho skull, a Neolithic skull decorated with plaster around 9,000 years ago, to more recent remains relating to individuals who died in the 19th and early 20th centuries. Most of the remains in storage are skeletons but there are also examples of preserved soft human tissues and human remains that have been modified into new forms or incorporated into other objects. These present different challenges for museum staff in ensuring that these individuals are respectfully stored in the best conditions to ensure their continued preservation. This means any handling, study or treatment of the remains is done within the context that they were once a living human being; a person who in common with people today had thoughts, emotions and life experiences. So why do we curate and display human remains at all? This is a controversial subject that has been debated for a long time and will continue to be discussed. There is no doubt that there have been, and will continue to be, huge benefits in having human remains available to study. The benefits of research however, must be set against the feelings of communities with strong connections to some of the human remains within museum collections. The British Museum has experienced several repatriation claims (see under related links on our Human Remains page), which are carefully considered on a case-by-case basis. Research using museum collections has been able to advance knowledge of the history of disease, epidemiology and human biology. It has also given valuable insight into different cultural approaches to death, burial and beliefs. This knowledge continues to grow as different techniques and approaches to such studies are developed and the total body of knowledge – within which comparisons can be made – expands. Display of human remains, both physically within museum galleries and online, is an important part of sharing this information to the widest possible audience. This not only spreads knowledge but may also help to generate enthusiasm for learning about our past; hopefully for the benefit of future generations. Of course, display should be done with careful thought. There is no justification for the voyeuristic display of human remains simply as objects of morbid curiosity. As in storage, displays of human remains must acknowledge that the remains were once a living person and respect this fact. Human remains should not be displayed if they are not central to the information being conveyed and this has led to removal of some skeletal remains from British Museum galleries. Where possible, visitors should be able to avoid seeing human remains should they not wish to and the views of source communities should also be respected if they do not wish ancestral remains to be on public display. There is no final word on such matters and no doubt the decisions made today will seem as out of step with current thinking in the future, as do decisions made by earlier generations of museum workers 50, 100 and in some cases 200 years ago. Looking after human remains in museums will therefore continue as a respectful balancing act across the boundaries of ethics, learning and access. If you want to know more, a recent book, Regarding the Dead: Human Remains in the British Museum, discusses the ethical and practical issues associated with caring for human remains and presents some of the solutions the British Museum has sought to curation, storage, access and display. The book also discusses some of the research that has developed our understanding of these individuals’ past lives. Further details about human remains at the British Museum. Regarding the Dead: Human Remains in the British Museum, edited by Alexandra Fletcher, Daniel Antoine and JD Hill is also published by British Museum Press.